Rusty bikes missing wheels, saddles, and other parts are a common sight on NYC sidewalks. Clearly abandoned, they clog up bike racks and other places to lock up, making it harder to park bicycles that people are actively using, and they’re an eyesore to everyone else. Cleaning up abandoned bikes is the Department of Sanitation’s job, but DSNY’s system isn’t effective, so the problem persists. 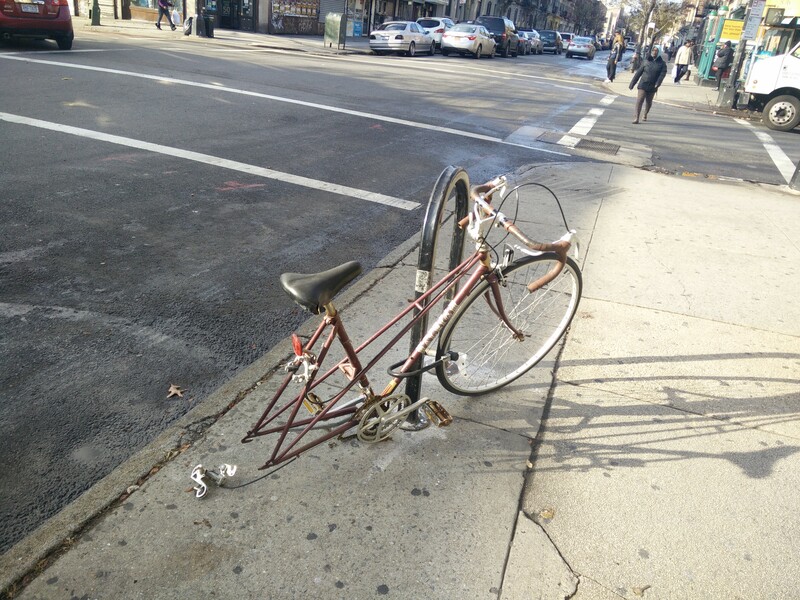 If you want to make the case that DSNY should change how it handles abandoned bikes, Recycle-A-Bicycle wants your help documenting the performance of the current system. DSNY is holding a hearing on its abandoned bike policy August 9. Before the hearing, Recycle-A-Bicycle is asking New Yorkers to report derelict bikes to 311 and record how the city handles the request. Under current practice, DSNY responds to 311 complaints about abandoned bicycles by placing a neon tag on the bike, after which owners have one week to remove the tag, or else the bike will be impounded. So Recycle-A-Bicycle wants to crowdsource an evaluation of DSNY’s system. If you call in an abandoned bike to 311, return in a week to see if the neon tag has been applied, and if so, come back one week later to see if the tag has been cut or the bike has been removed. Each time you check on the bike, you should snap a photo and send it to seetagcut@recycleabicycle.org. 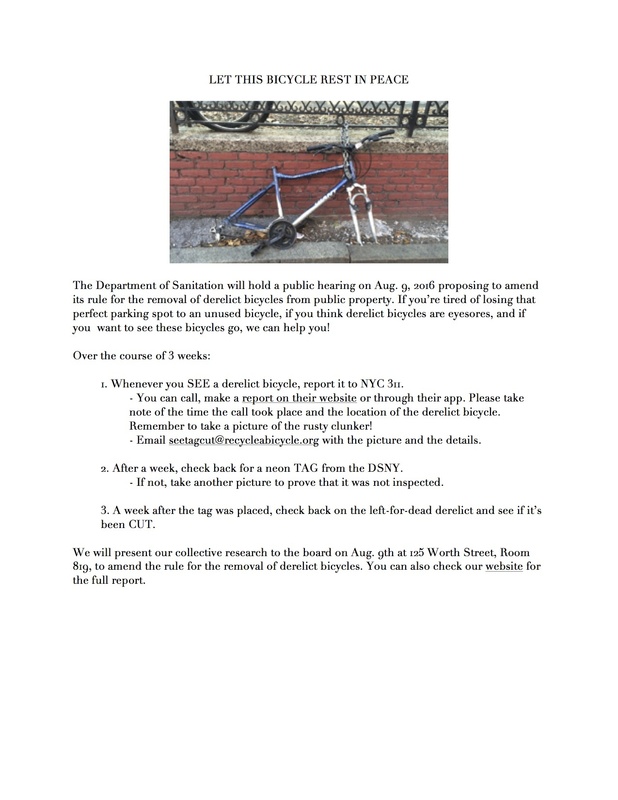 DSNY has had the authority to remove derelict bikes since 2010 but hasn’t made much of a visible impact on the problem. “The Department of Sanitation is not set up to fully handle the abandoned bike process, or rescuing abandoned bikes,” Overton said. At the meeting on August 9, DSNY will consider three proposed changes: reducing the number of criteria required for removal to two, removing flat or missing tires from the list, and lowering the rust threshold to 50 percent [PDF]. Overton would like to see a major shift in the city’s approach, like the city-wide implementation of a program along the lines of a Recycle-A-Bicycle proposal to provide low-income youth with summer jobs identifying, claiming, and fixing up abandoned bikes to make them useful again. After a City Council hearing in December on abandoned bikes, DSNY committed to addressing concerns about its bicycle collection process. You can email comments to nycrules@dsny.nyc.gov or testify at the August 9 meeting, which is happening at 10 a.m. in Room 819 or 125 Worth Street. That abandoned bike pictured here meets the first three criteria, no? Sanitation workers walk down every street every week. How about having them tag bikes that look derelict with a date on the tag, and remove them two weeks later? The recycling workers are undertaxed. And while it might be a big effort at first, it would be far less thereafter. But the derelict car problem was solved by tag and remove. It’s certainly missing parts, and missing a tire (and entire wheel). It’s not crushed or rusted, so it depends on what “unusable” means. A bike in this shape that isn’t rescued promptly certainly will develop those other symptoms, so why not remove the street clutter, recycle the parts and free up the bike rack now? It’s certainly unusable without the rear wheel. In any case, I fully agree that that bike should be removed and the criteria should be loosened as proposed if that increases the likelihood of derelicts like this getting removed. has the City come up with a way of dealing with this yet? or do you have a vigilante group of volunteers clearing junk bikes? in Portland Maine, community cyclists are looking at a public-private partnership between a couple of environmental and cycling organizations and the City to deputize volunteers to document/tag/remove delinquent bikes and donate them to a group that refurbishes them and donates them to refugee communities.